Latest News, Announcements and Highlights from the Society. Read a recap of the 39th Annual Meeting and view video recordings of select sessions. Receive updates from SMDM through e-mail, web or social media. The Board of Trustees of the Society for Medical Decision Making extends its deepest appreciation to everyone who supported the 2017 SMDM Annual Fund! The University of Cincinnati CCTST Conference takes place from April 11-12, 2019 at the Sabin Hall and AC Hotel by Marriott, Liberty Township, OH. "SMDM is the professional home to what I consider the top scientists in the field and the scientific meetings always inspire me. I also consider SMDM membership an indicator of exposure to rigorous methods and cutting edge science when reviewing resumes." 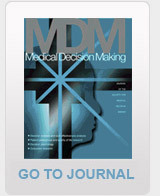 MDM offers rigorous and systematic approaches to decision making that are designed to improve the health and clinical care of individuals and to assist with health policy development.